It starts with your business. We understand that service interruptions are costly and disruptive to your bottom-line. Our network is built on the best industry carrier environments. With over twenty years of industry experience, we combine rigorous project management with the best people, processes and tools. Reliable connectivity between business headquarters and remote branch locations is essential for the continuous and effective operation of mission critical applications, such as: Email, CRM, ERP, Intranet and distributed databases. The challenge is to manage, secure and optimize end-to-end link traffic from headquarters all the way to remote locations ensuring the continuity of applications while controlling connectivity costs. We are your single point of contact for all your network connectivity issues, taking ownership of problems to resolution. 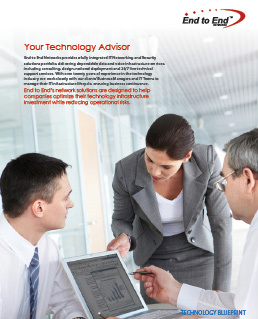 With End to End Networks, you have a partner who is dependable, accountable and always available. Reliable Performance Delivering optimal uptime for your business critical applications, backed by 24/7 live network monitoring and support. Optimize your Interconnection Costs Prioritize your data, voice and video services – on a plan that supports your budget with customizable programs available. Transport Sensitive Data Securely The Ethernet Private Line service is ideally suited for business environments that are responsible for transmitting and storing sensitive data. Expertise Maximizing network value by utilizing next generation technology that enables you to improve service to your existing customers and gain a competitive advantage. Flexibility We offer full range networking options to meet your connectivity needs: point-to-point, point-to-multipoint, fibre, cable, wireless and EVPL. Reduce your telecom expenses without compromising on call quality or reliability. Bring your telephone, video and data networks together! Session initiated protocol (SIP) is a standard widely used for controlling communications like voice and video calls over IP Enabled Networks. SIP trunking is a technology that delivers local, toll-free, and domestic and international long distance service on a single IP backbone. The End to End Network solution supports virtually all SIP standards based IP PBX’s, desktop handsets, and softphones available in the North American market today. SIP trunks allow for flexible and cost-effective scalability as opposed to the traditional legacy PRI methodology of buying set fixed trunks. End clients pay only for what they need – SIP trunking enables the flexibility of increasing the number of individual voice sessions on an as-needed basis, where traditional PRI trunks require installation of new hardware and provide additional voice circuits in predetermined increments of 23. Converge Voice, Data and Video networks for optimal performance and eliminate the cost of supporting separate infrastructures. Reducing or eliminating the costs of dedicated PRI connections and legacy voice hardware. Extending IP voice in the LAN over the WAN. Reduce long distance fees associated with calls between offices that are already connected by a data network. Centralize the number of PBXs needed to manage inbound voice traffic. Unlimited calling in North America, and international calling is metered.